What I weekend that was... It was 50% awesomeness, 50% crazy-stress. Go figure. My Saturday was the awesome part. I met friends, whom I haven't seen in way too long, for brunch and we got to catch up over some huevos rancheros and grilled cheese sandwiches. We then proceeded to walk around the Riverside neighborhood where I randomly walked into a shop selling secondhand furniture. Turns out I walked in Debbie's Vintage Vibes. The furniture in the front threw me off for a moment, but you can only imagine how excited I was then I realized that the back of the shop has a room full of vintage clothes (and jewelry and accessories and shoes...). And good ones too! And, I think the best part was Debbie herself. She's so awesome and knows what she's talking about. I kinda didn't want to leave. I'll go back with more time, it's time to thin out the closet again, so I want my vintage pieces to have a good home. Sunday, on the other hand, ended up being quite stressful. There wasn't any particular one thing that stressed me out, but it was a concentration of so many things. Some longer term plans of ours changed quite drastically, so all of a sudden all schedules are completely off. I have to now finish a lot of projects in a few weeks instead of a few months. I have to give up on some plans. No need to dwell on the negative though, so let's just start a new week with some mail. Let's start with the collage one. It's a larger size than my regular ones, so I had to get creative. I didn't have a envelope that large, so I gift wrapped it. There's also a lot more space to decorate, so I ended up making a black and white collage out of paper I had at hand. I find this is how most of my collages come to life. They are a combination of things I have just been working with in the right color scheme. Then we have a more simple one. 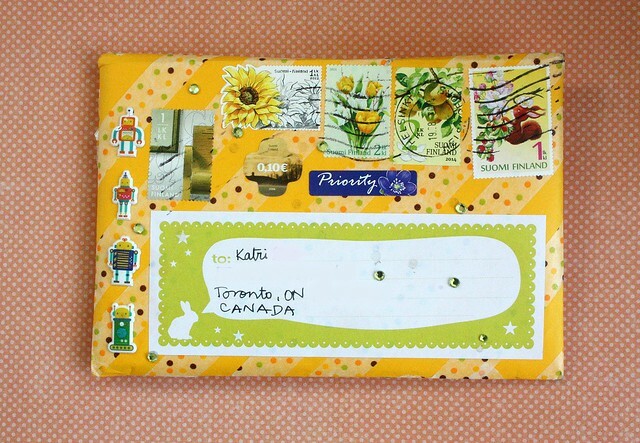 A autumn-toned envelope. 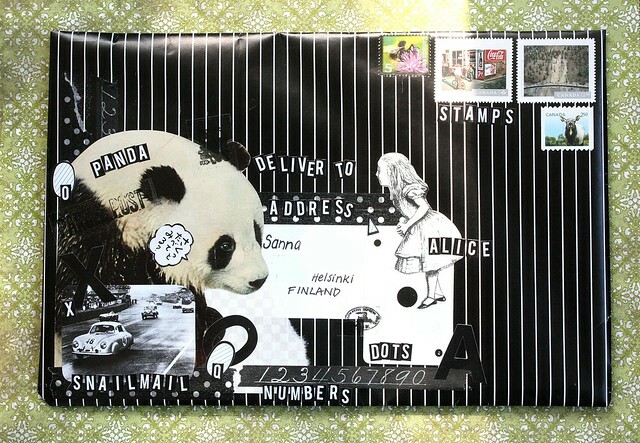 I actually used the stickers on this mail first and then started using them on the previous one. Hence, spelling out a lot of random things until the letters ran out. Please note the color-coordinated candy at the bottom! This one's going to Mary who, as it happens, just mentioned she's getting a cold. I'm glad I just sent this package out, since it's actually tea. The bag of tea is behind the envelope and all of this is in a cellophane bag. Now, let's just hope it gets there really, really soon. I'd like to think I had great foresight in sending this! Ooh, a fun aqua one for me! How nice is that monogram sticker on the corner there? And you gotta love the Korean stickers! Well, not to mention the actual letter inside. 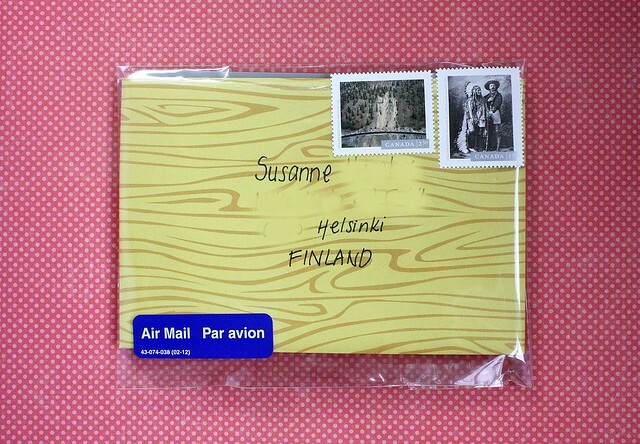 Thank you Susanne! So, question of the day: if you get into a stressful moment in your life, how do you handle it? Any nifty tricks? I'm so excited about the things I found at FanExpo. I could've bought so many things, but I was good and only got the things I absolutely wanted! I got three books. The first one is the Pieces of Wonderland I already mentioned in the FanExpo post. Next one is The Wildlife of Star Wars: A Field Guide. It's an amazing book with gorgeous illustrations. I mean, come on, all sorts of creatures from the Star Wars universe! The wildlife is divided into sections according to the planets they live on. The creatures include some obvious one like the Tauntauns (most notably seen in The Empire Strikes back) and Sarlaccs (Seen on Return of the Jedi) but also a little less known ones like Ottas and Urusai. Finally, I found Fairy Quest: Outlaws. A friend told me about it and just like that, one copy happened to be there, on the table all by it's lonesome, just waiting for me. The art is beautiful and the topic is exactly what I love; new adaptations of old, traditional stories. In this case, fairytales. 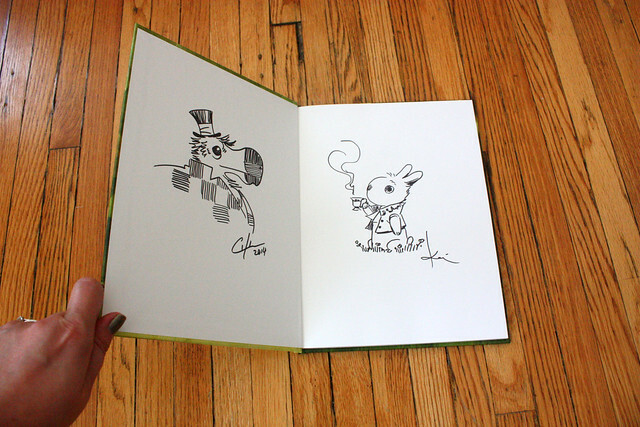 Like I mentioned I met the illustrators behind Pieces of Wonderland and they both sketched on the book alongside with their autographs. How awesome is this? I did collect a ton of business cards and brochures, here's just a few of them. Obviously the expo guide as well. 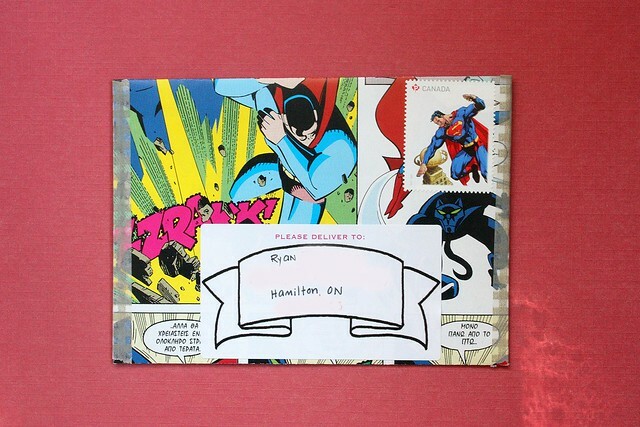 That's the booklet with Batman on it, if it wasn't clear from the large friendly letters spelling FanExpo. The other purchases is the print of Batmobile by Ron Gyuatt. It's the Tim Burton Batmobile (guys, these are important details!) and a part of a series of three Batmobiles. I loved pretty much everything and could've easily bought half a dozen posters just to start. Very nice guy too. Once I have decided where to hang the poster, I'll share a better photo. 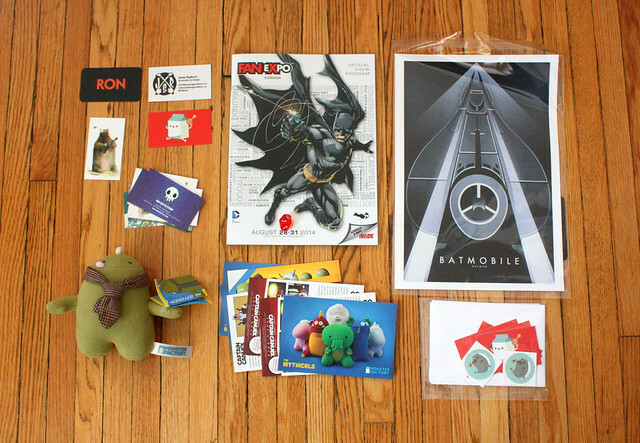 Below the Batmobile is a few small cards (A pet Narwhal for Max's room) and a couple of stickers from Rosey Cheekes. If you like cute things, you need to check her work out! She's just as cute as her illustrations! I had a nice chat with her about the Expo experience as a whole and it was so nice to get a small business owner's view on the whole experience. 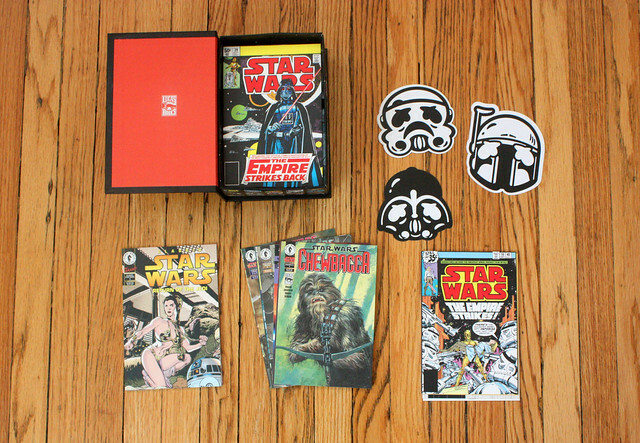 The black and white characters are stickers by Jesse Rayburn. I snatched up the last dark side one and got a few others too. Need I mention he was very nice?! Since I'm on the topic... Every single person I talked to was great. Ultimately I felt extremely welcome and had a blast. So, what do you think of my finds? Any that appeal to you? Please share your nerd-loves! This is a tutorial on how you can make washitape* at home! It's easy, fun and pretty inexpensive. Anyone can do it, I promise! The tricky thing about the tape is that it can be pretty expensive.There's a bazillion different prints, but picking only one can be tough. Pick a couple and you're all of a sudden racking up quite the bill. On top of that, despite those bazillion prints, sometimes I have this awesome paper that I wish was tape because I have this project that could totally use it... I can't be alone with these thoughts! So, I wanted to share how I make my own tape at home! 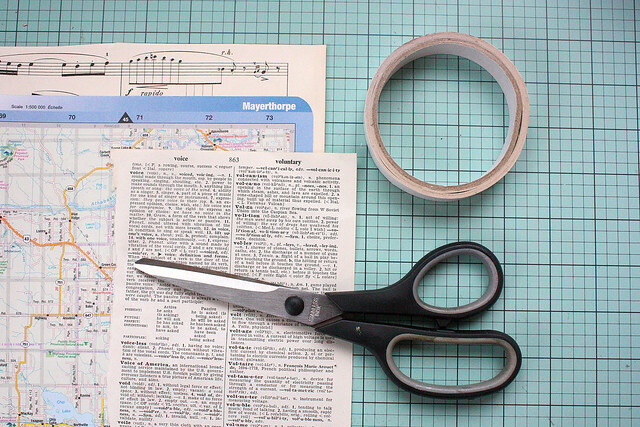 I'm using vintage paper; I picked a music sheet, a map and a page from an old dictionary. 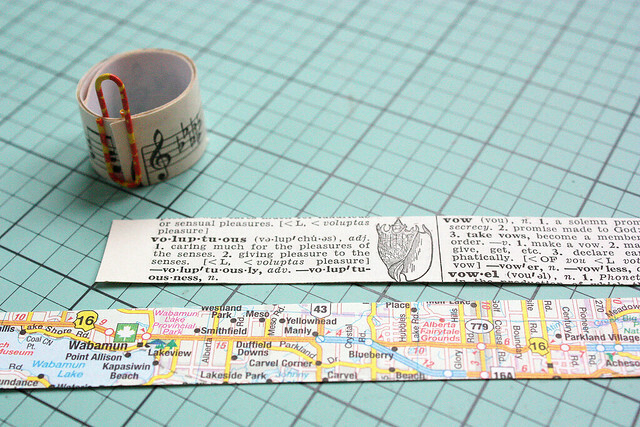 Pick the parts of the pattern you want on your tape and start sticking the tape on the opposite side. 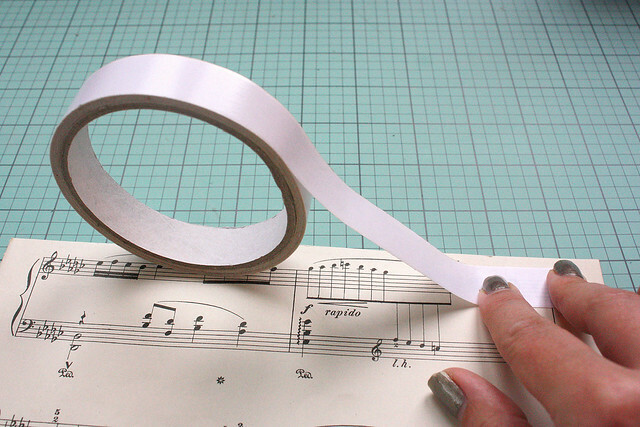 Run your finger over the tape to make sure it sticks properly. 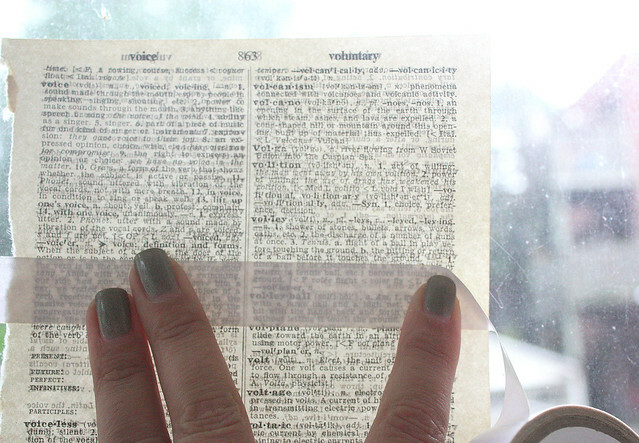 If you're using thin paper, like the dictionary page I used, you can place the sheet against a window to see exactly where to place the tape. I wanted the illustration of the shell to show on my tape. On some materials the placement doesn't really matter, like on the map. It'll look cool, no matter which part is showing. You can just stick several pieces of tape on it and they'll look really fun once they're finished. 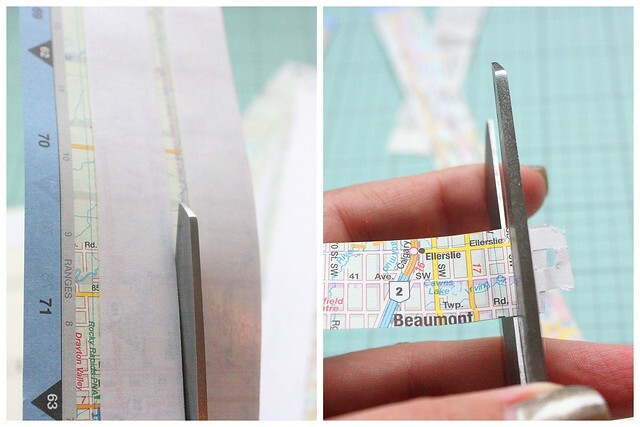 Once you've laid down the tape, start cutting the strips out. Cut the lengths first and then trim the ends if needed. Woohoo! You're done! Off to crafting! 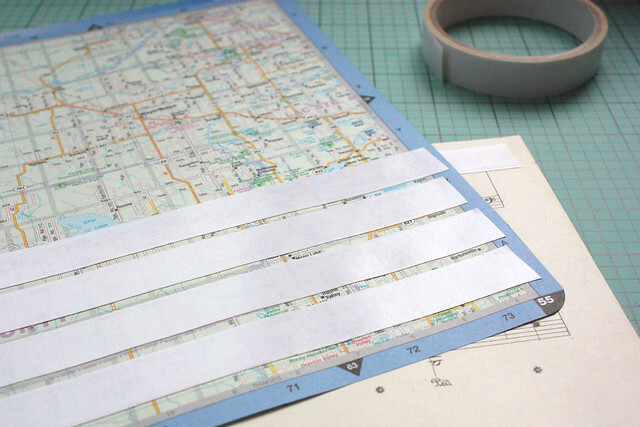 You can use this for most projects you'd use regular washi tape. I find there's two major differences though, 1) the DIY version is not repositionable (unless you use repositionable double-sided tape, which apparently exists. I Googled it.) and 2) this is harder to tear, so you might want to cut it instead of tearing it to size. 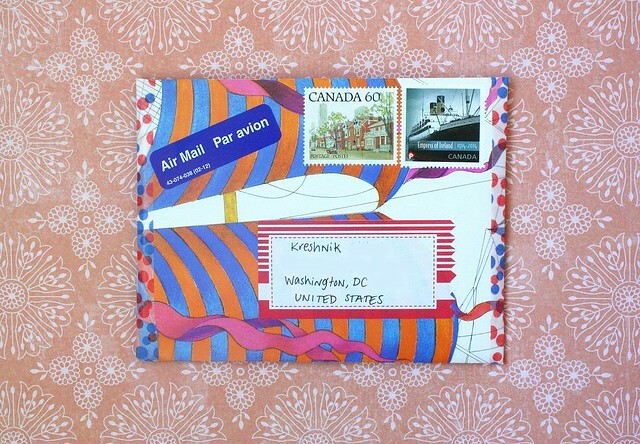 *) Please note that I use the term "washi tape" loosely. Technically washi tape is made from Japanese Washi paper. 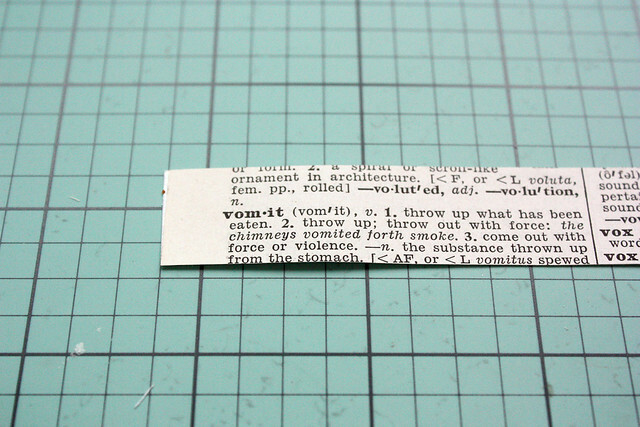 So, I guess the more accurate term is paper tape. 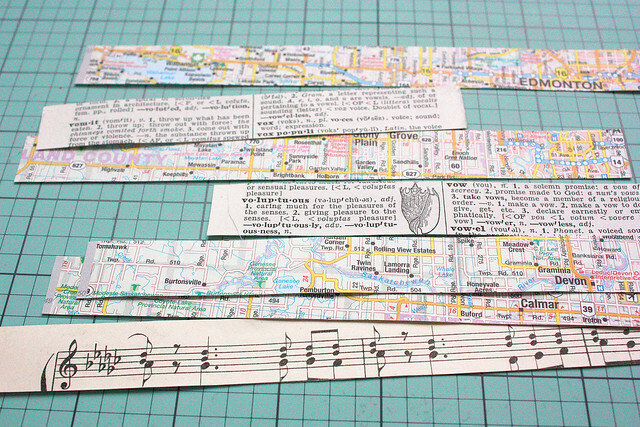 I'm using the term "washi tape", since that is the common term used to refer to this type of a crafting material. I got a cold about a week ago and it's starting to get pretty annoying. I am somewhat functional, but I feel everything takes me a bit longer than usually. This is a very simple one. 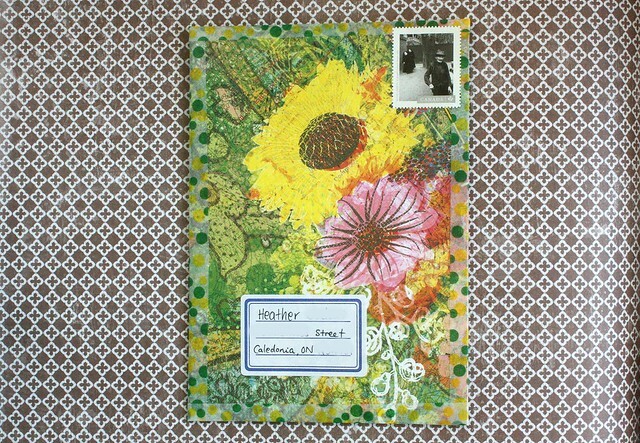 I liked the wood grain envelope and felt the photography stamps went well with it. 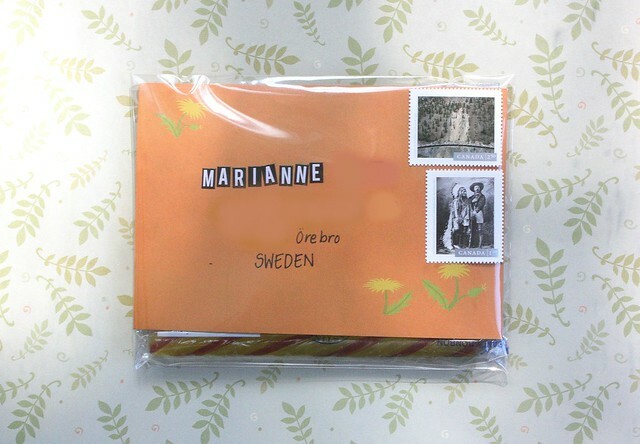 There's no additional decorations, but I mailed it out in a plastic sleeve, since there was another small item, besides the letter, being mailed out. 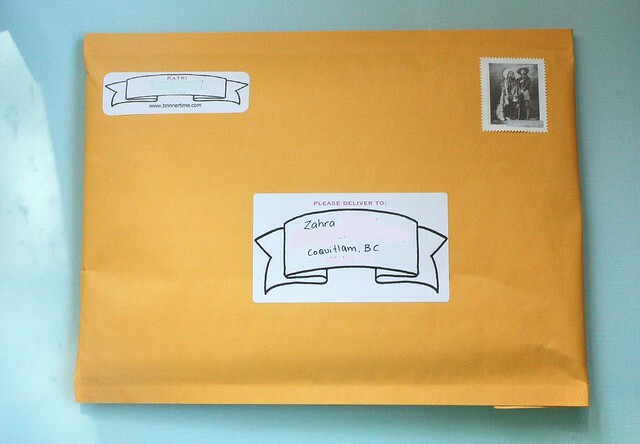 I don't think it has arrived yet, so I won't share a photo that might spoil the surprise. There's more mail going out this week. Well, that's the plan at least. Right now I'm drinking crazy amounts of tea in hopes to start feeling better. I briefly mentioned on Facebook that I was going to FanExpo. I was very excited to go and it surpassed my expectations by far! I figured it would be great, but it was so much fun that I came back a bit overwhelmed yet incredibly, tremendously inspired! This was the smaller part of the expo... The other side was much bigger. 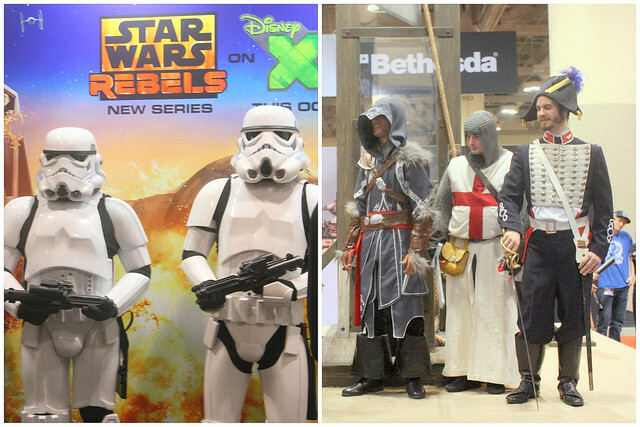 FanExpo is basically a gathering place for fangirls and -boys. Whatever your fandom is, you'll find others there too! There's an incredible artists alley, where you can meet international and local artists, both already established and those new to the industry. You can get sketches drawn just for you and chat about your favorites. 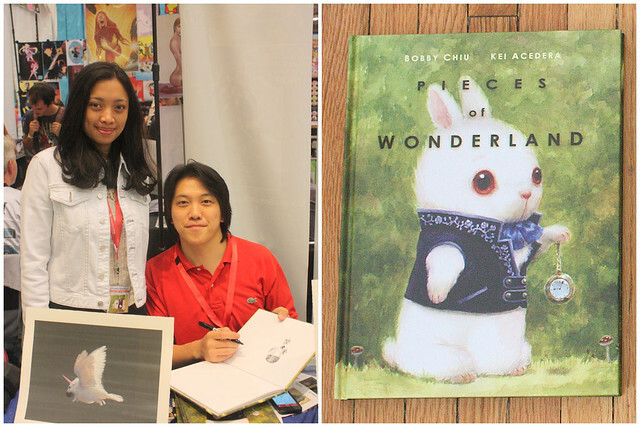 I had a total fangirl moment meeting Kei Acedera and Bobby Chiu. I am a huge fan of Alice in Wonderland as well as Tim Burton, so you can imagine how excited I was to see the concept art from the people who designed characters for Tim Burton's Alice in Wonderland! I actually saw a book of their illustrations first, squeaked a little out of excitement and wanted to buy it immediately. Only then I realized I could actually get it signed. That the incredible artists were actually there! So, now I have the book with sketches from both of them! The selection of comic books is overwhelming! 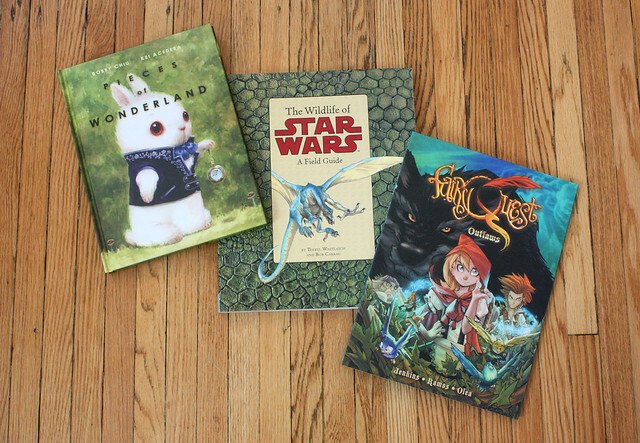 You can get hard-to-find artbooks at a really great price. Honestly, the affordable price is just a bonus though, some of this stuff is hard to find! Let's be honest though, a lot of the stuff I had no idea existed. But I did want it once I saw it... I did stay within reason with my purchases, but I got some great stuff! I'll share those in another post. I didn't dress up, but I did wear an event-appropriate t-shirt. There were so many amazing costumes! I was a tad shy to ask people to pose for me, but I got some photos of some pretty impressive costumes. The photos don't do them justice. I did dress up my son Max in this incredible onesie gifted by his awesome aunt. 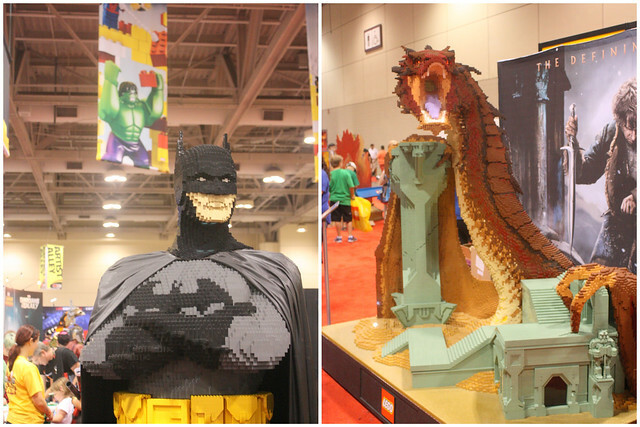 I love everything about this photo: Batman, Smaug and Legos! Does it get any better? All in all, it was amazing. I want to do it again! I had the best labor day long weekend! It was pretty hectic at times, but totally worth it! 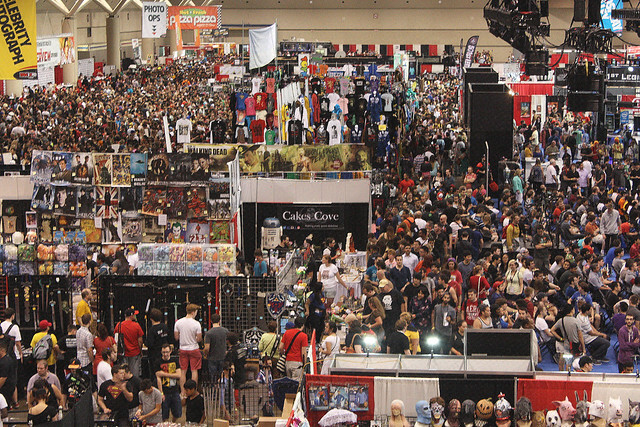 It started with an impromptu party at our place on Saturday, continued with FanExpo on Sunday and ended with Canada's largest Ribfest on Monday. 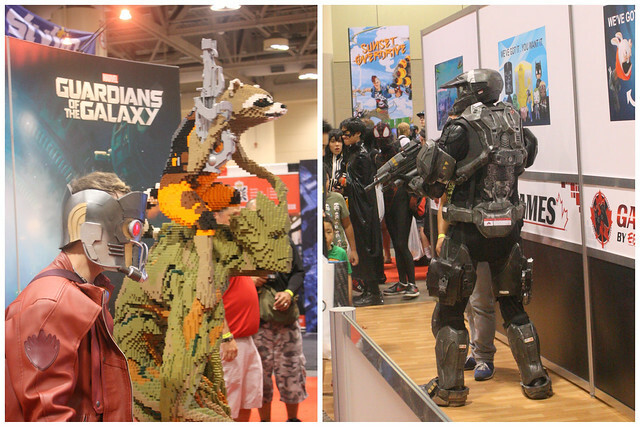 I'm still quite in awe of FanExpo, but I'll share some photos later. I am so incredibly inspired after visiting the event, that I don't quite know where to start. It's 6 in the morning right now, but I can't sleep, so might as well get some ideas out of my head straight away. The amount of talent was incredible and the topmost feeling I have is that I really want to take part as an exhibitor one year! We'll see when that happens. I'll keep you guys in the loop! Last week was slower for mail. I sent out only one, but received one as well. I actually have a few more things going out, including a letter a wrote over a week ago, but you'll see those next week. I wanted to try out an upright letter for a change. It worked out nicely with the pattern on the paper I was using. I even managed to find an upright stamp to go with it. 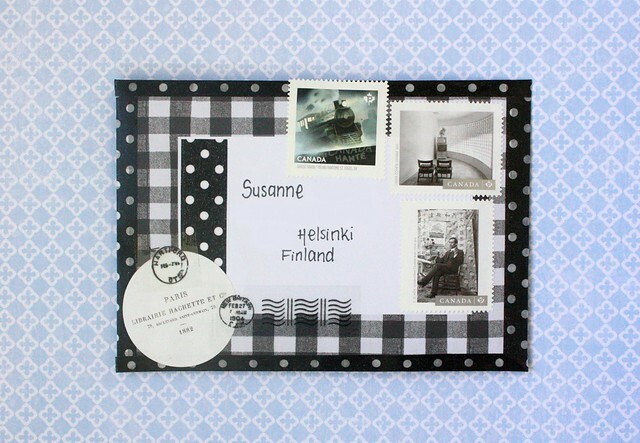 It's actually from a new set of stamps that came out recently. Besides that, it's a fairly simple one. It's the paper that really makes it. I got this bright yellow one from Susanne. 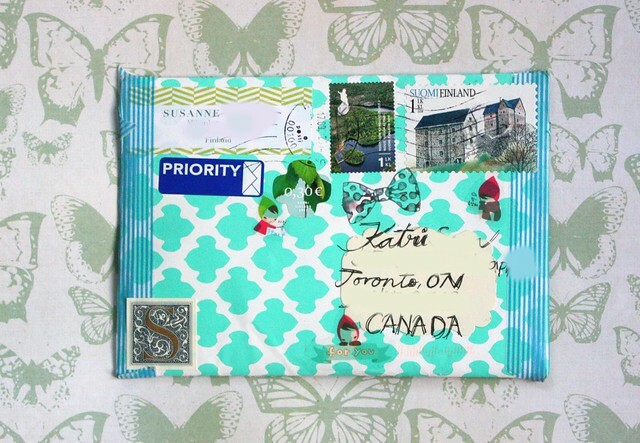 It had a letter and a paper pack from her trip to Japan. I already have some ideas how to use the papers. How was your long weekend, if you had one? How has your week started if you had a regular lenght weekend?